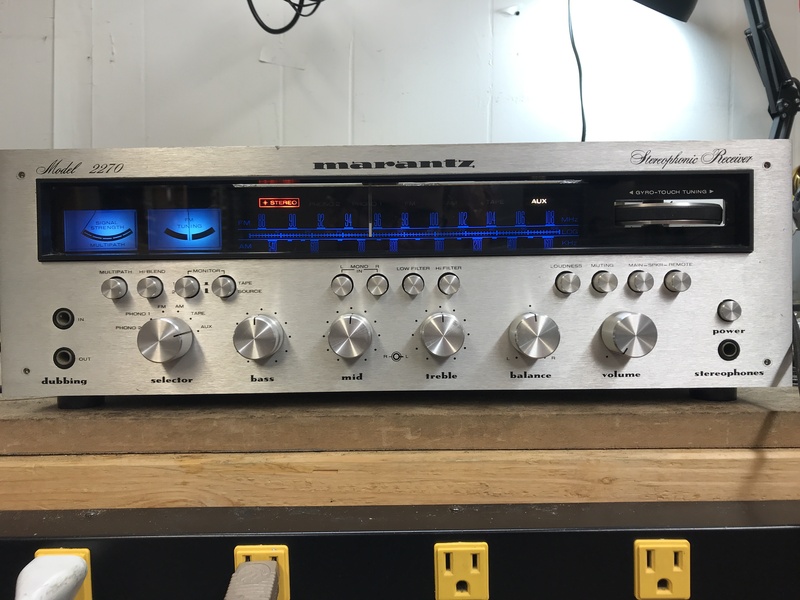 Here it is, our most commonly restored item, a Marantz 2270. These account for maybe a third of our restoration work, and we are on our third 2270 restoration work this month. This one came in with complaints of the relay taking a while to engage which is somewhat common. The customer also wanted a full recap/restoration, an LED conversion, and new 5-way speaker binding posts installed in the rear. 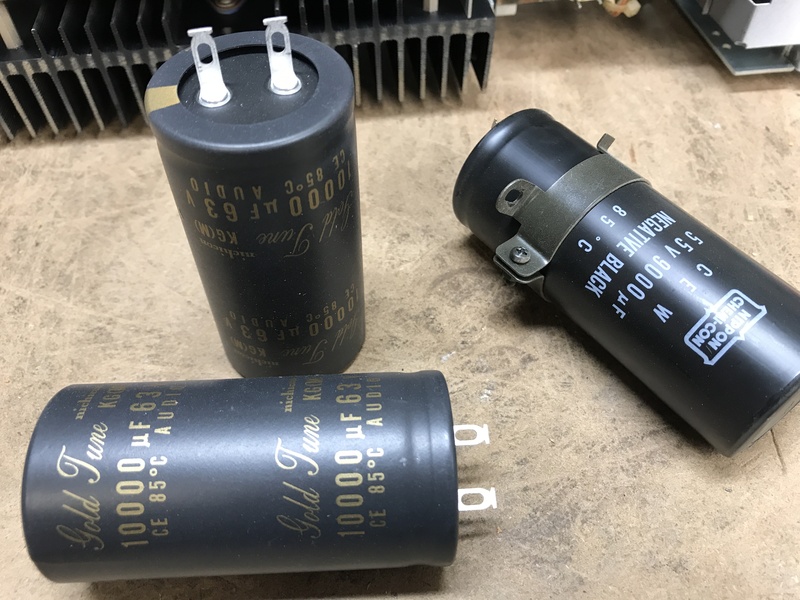 Due to how often we restore these units, we usually keep everything we need for a 2270 restoration on hand, even the large filter caps and relay replacement. After a quick test, we got started! These are the originals, 9,000uf/55v electrolytics. 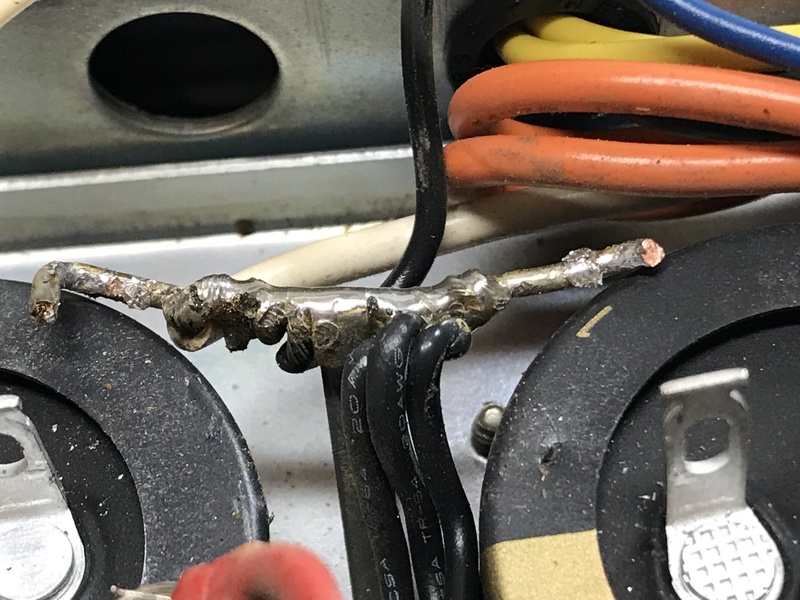 Trying to keep enough slack in the wiring, the positive and negative leads are removed (and cleaned up before reinstallation) and the little ground bar is de-soldered and pulled away. 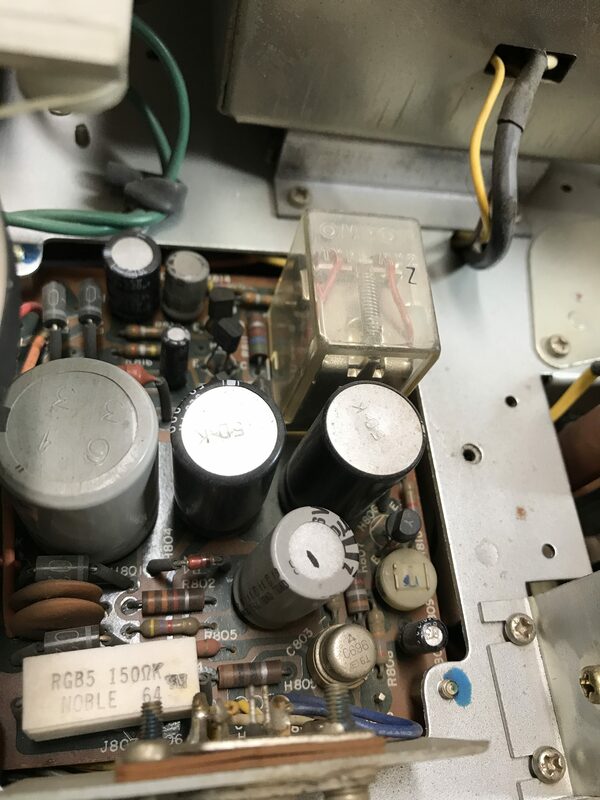 The original grounding bar for the filter caps gets brittle with age. 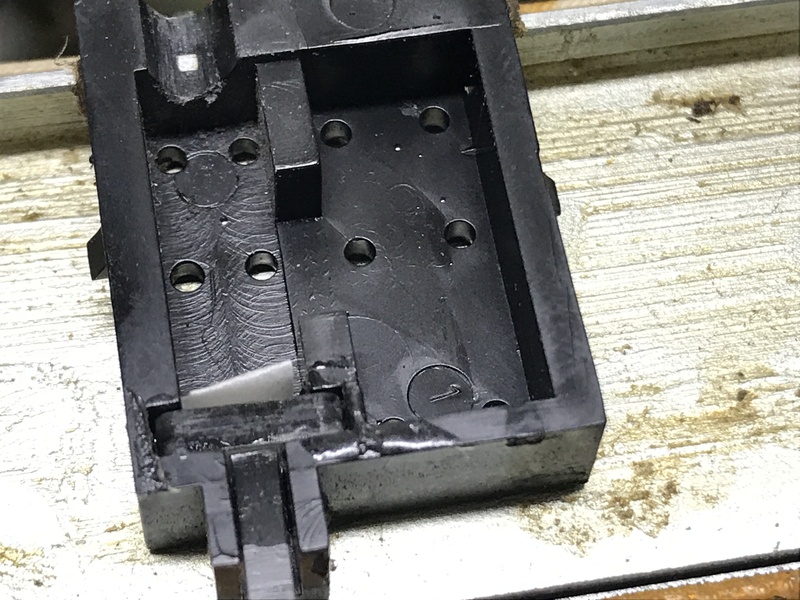 A slight modification will be done to make a neat and safe connection to the new caps. 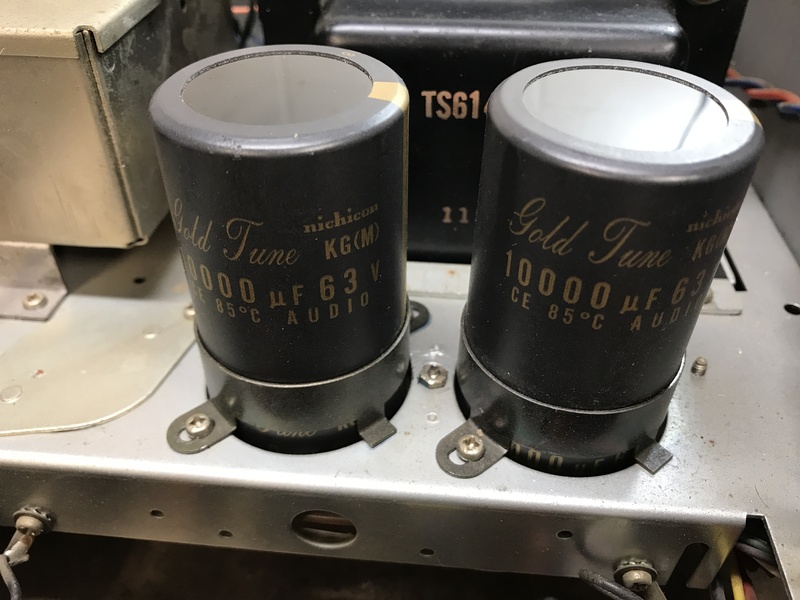 The caps are replaced and slightly upgraded to 10,000uf/63v Nichicon Gold Tune caps. They are slightly shorter, but the diameter and termination style is the same, so they drop in nicely. The caps were installed the same manner and the leads to the caps were cleaned up. The ground bar was attached to each cap with quality high current wire. These new caps have great specs for high reliability and can withstand high temperatures. They are made for audio, and will help the overall sound of the receiver a lot, especially the low end. Moving on to the amp boards next. There isn’t much to change here, but the parts you do change are still important. 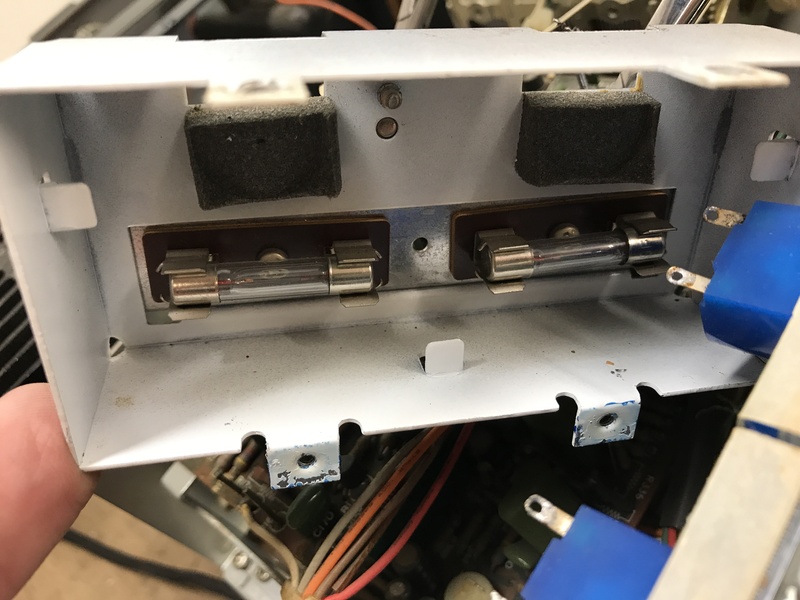 The two 10uf electrolytics will be changed, but also the 22uf tantalum capacitor is changed. Tantalums were used a lot in the past rather than film in some applications. However, when tantalums fail, it can cause a lot of havok. The biggest upgrade on the amp board however will be replacing the input pair of transistors. The balance the DC power on the amp board, controlling DC offset. Putting in a matched pair will help dial DC offset as close to zero volts as possible. 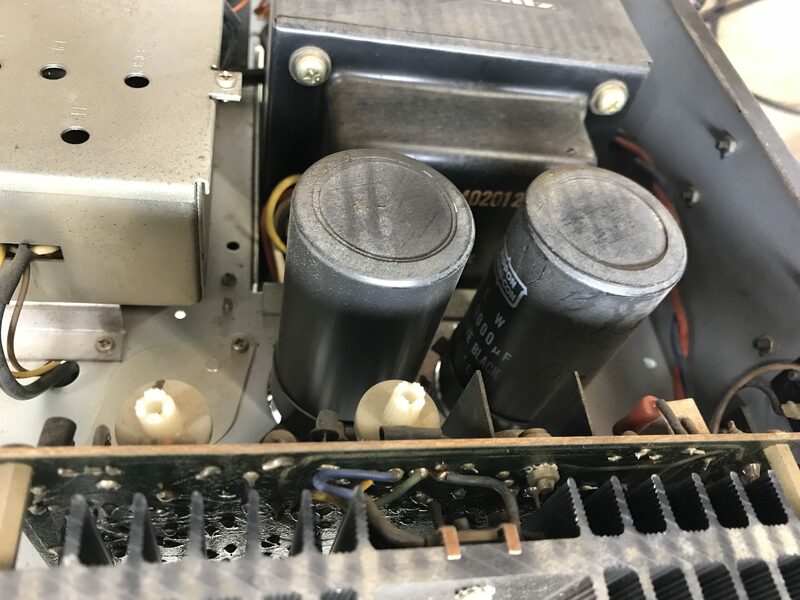 Fairchild KSA992 transistors are joined with thermal past and then heat-shrunk together. They perform better when thermally coupled. 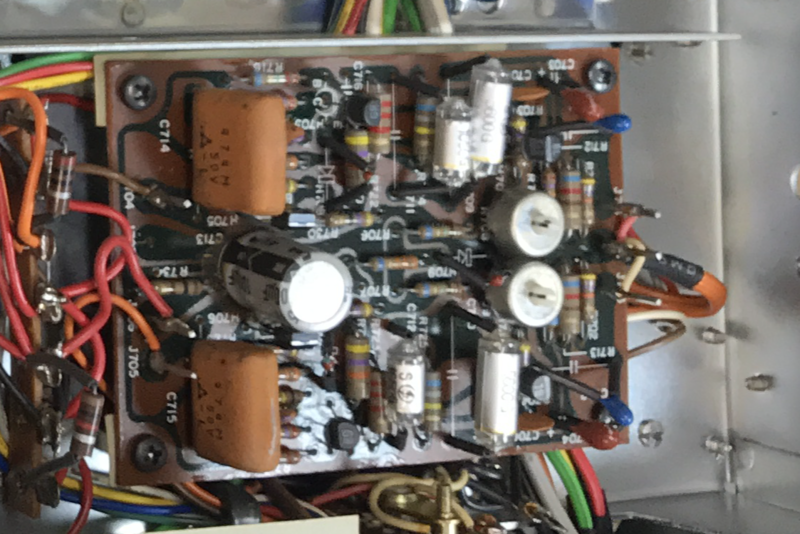 With the amp boards out, it is easier to access the speaker connections. We custom design and 3-D print our own new mounts to attached 5-way binding posts. 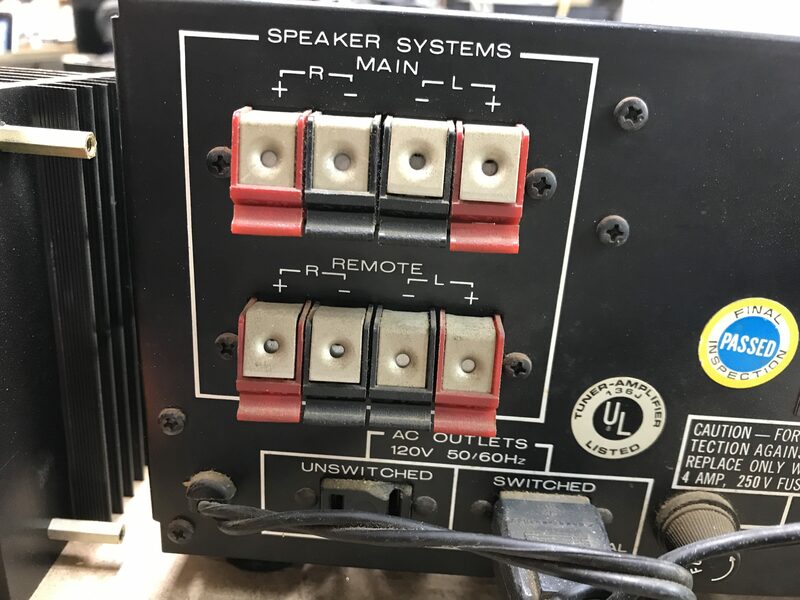 We can do this for just about any vintage receiver and it is a big improvement over the older style of speaker connections (left picture, below). Many people play these restored receivers on newer speakers which have modern connections. 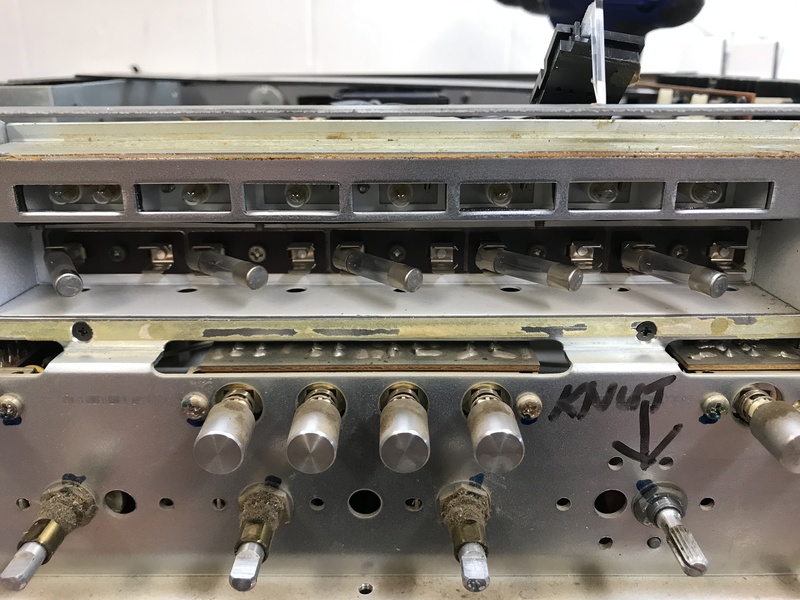 Whether or not the speakers or their connections are new, these new binding posts (right picture, below) provide a better connection and can allow our customers to use new, higher quality speaker wire. Also, most vintage receivers have selectable speaker outputs. 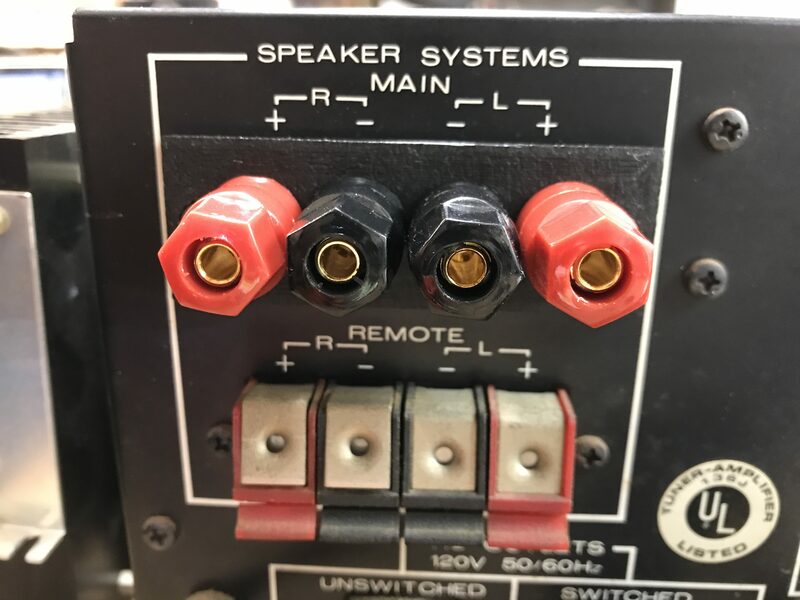 For instance, the Marantz 2270 has “Main” and “Remote” speaker connections. By swapping out one one of these two connections, you have the option to use the originals as well, should you need to. The preamp board was next. This board is pretty straight forward. All of the 1uf and 3.3uf low noise caps (the white and yellow caps on the original board, top picture on right) are taken out. Going in are Nichicon KL series, low noice electrolytics. 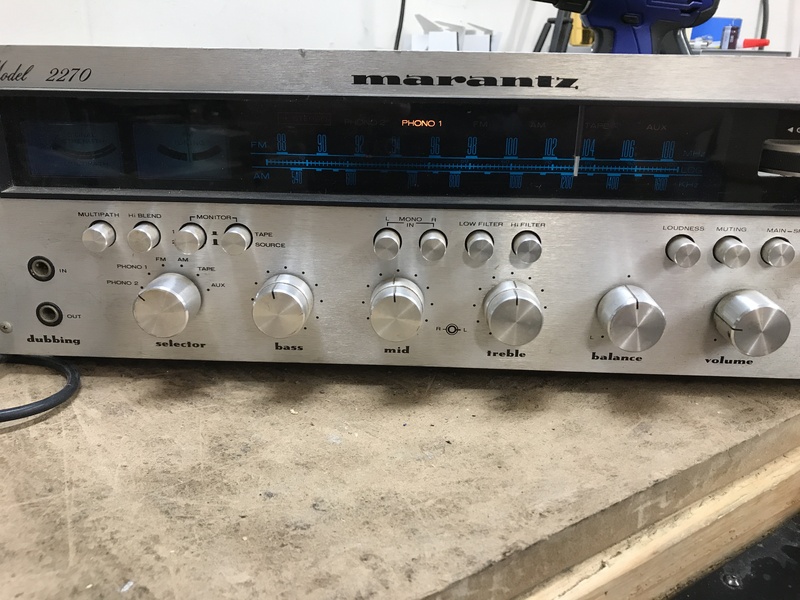 After the original circuit design, but before production, Marantz must have altered the design slightly. The white 3.3uf and the smaller yellow 1uf capacitors share one hole in the circuit board where they are in series. The new capacitors have slightly thicker leads, so the holes are bored out slightly to accommodate the new caps. You must be careful to not destroy the trace on the underside of the circuit board. 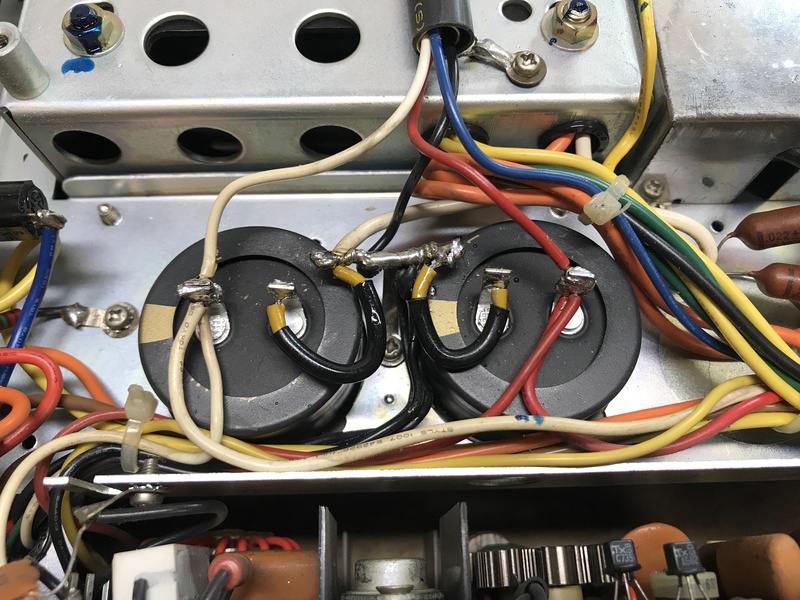 The black filtering caps on the original board are replaced with high-temp/reliability Nichicon PW capacitors. That’s it! 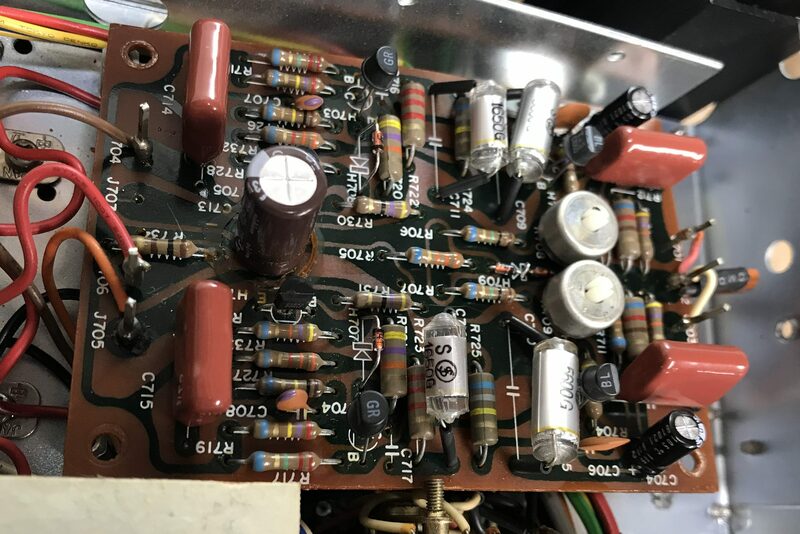 Some 2270s, depending on production era, have transistors known for noise and failure, most notably the 2sc458 transistors, which we will get to on the phono preamp board. This unit had none, and the originals were all good, therefor left in place. 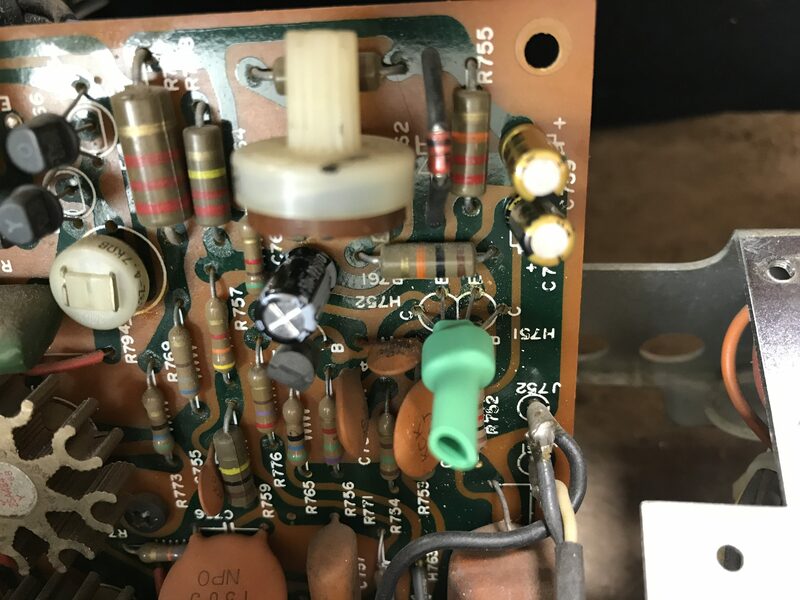 Many times, replacing transistors with new ones when unnecessary can cause gain issues resulting in weird oscillation type issues. The preamp board (to left, original on top, new on bottom) gets a lot of work done, some restorative, some to upgrade and modify. 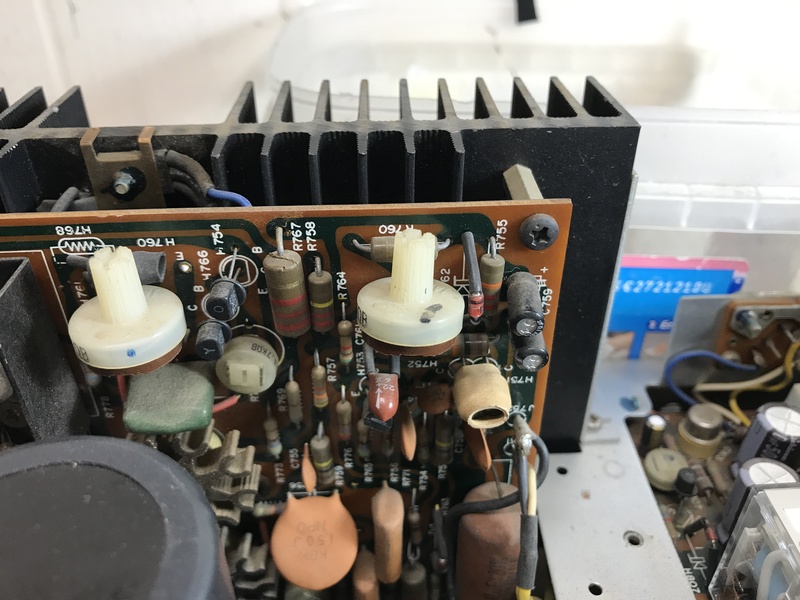 Those commonly failing and noisy original 2SC458 transistors mentioned above are finally found on the phono board for this unit (H705/706). 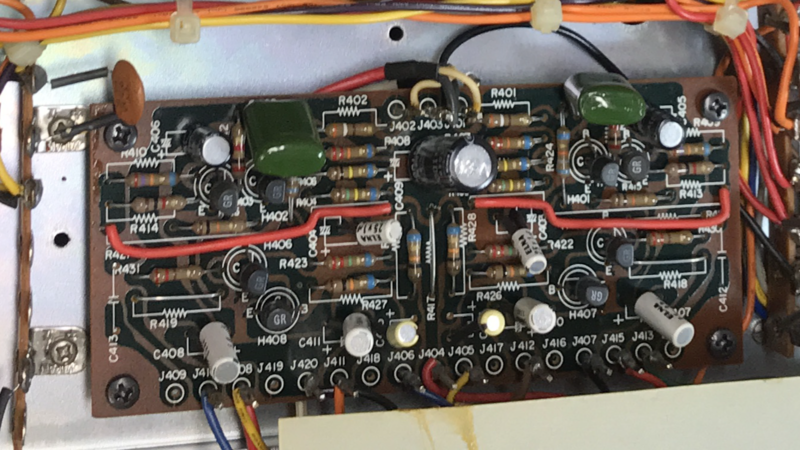 New Fairchild KSC1845 transistors are swapped in. 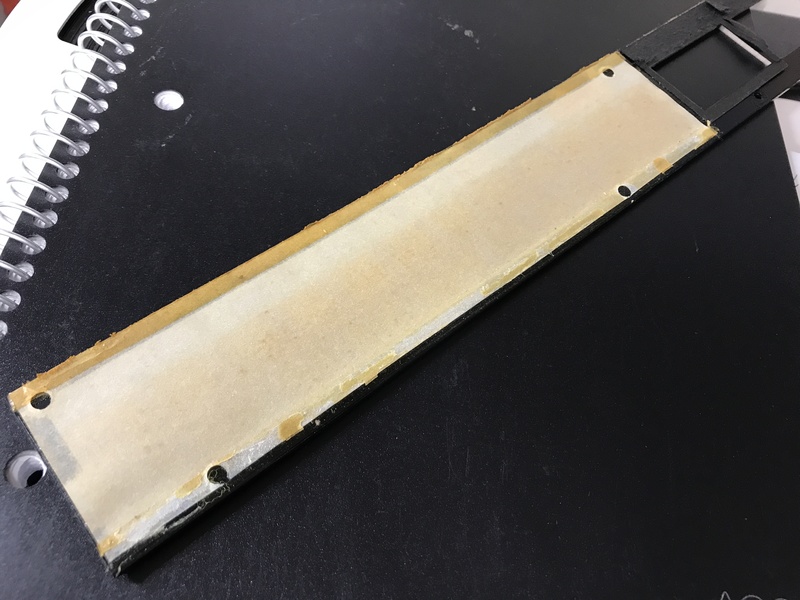 These are located on both side of the filter cap on this board. This also gets replaced, but also upgraded from 100uf to a 220uf Nichicon PW cap. The original, low quality, little bead type diodes, H707/708 are also changed to the popular 1N4148 diode. H709 is replaced with two 1N4148 diodes in series. 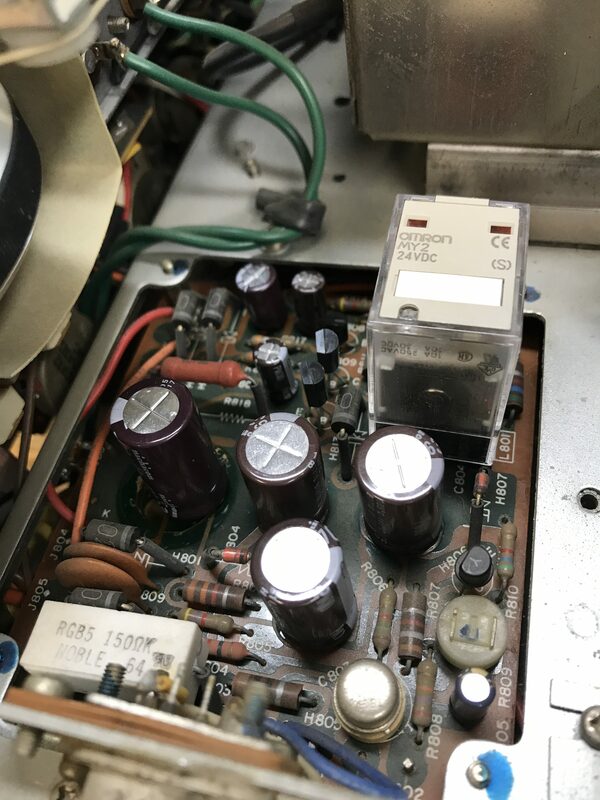 Another upgrade for better sound through the phono stage is to change the two original blue tantalum coupling-caps (c701/702) and the two 0.47uf light brown caps (C714/715) all to 1uf Panasonic ECQ film caps. 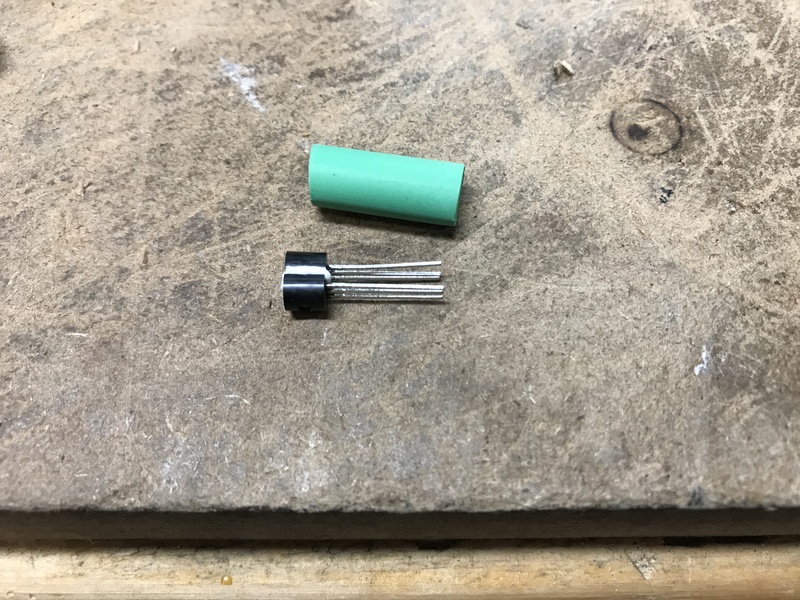 We also change the 22uf red tantlums (c703/704) to Nichicon KL low noise caps. The original phono stage in a 2270 is great, and a goos building block to improve. 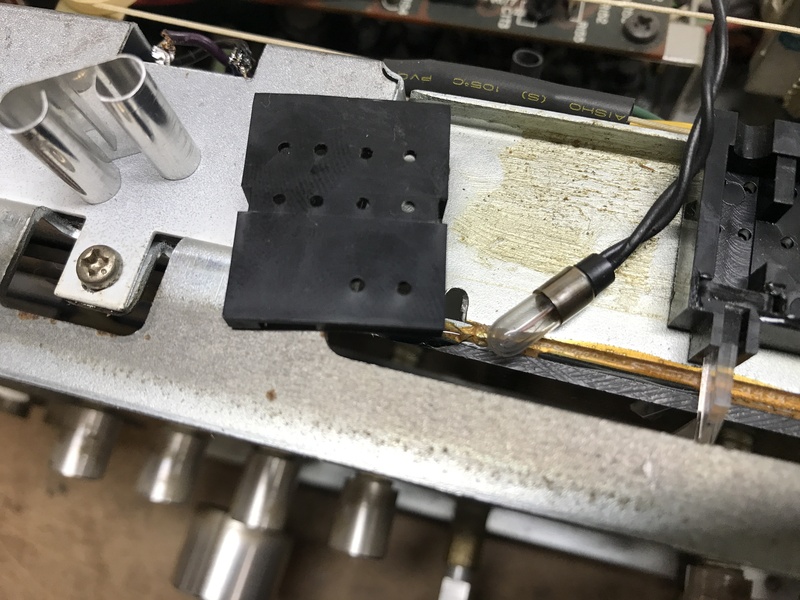 The end result of all of this is a better sounding, lower noise, and more reliable phono section, which most 2270 owners use as part of their vintage/analog set up! As the restoration wraps up, the lighting gets entirely converted to LEDs. IF the lamps still work, the dial has turned green by now due to heat from the lamps. LEDs are more reliable, and run cooler. We went through a lot of different LEDs to find the right ones to make the unit look as it did when it was first sold. 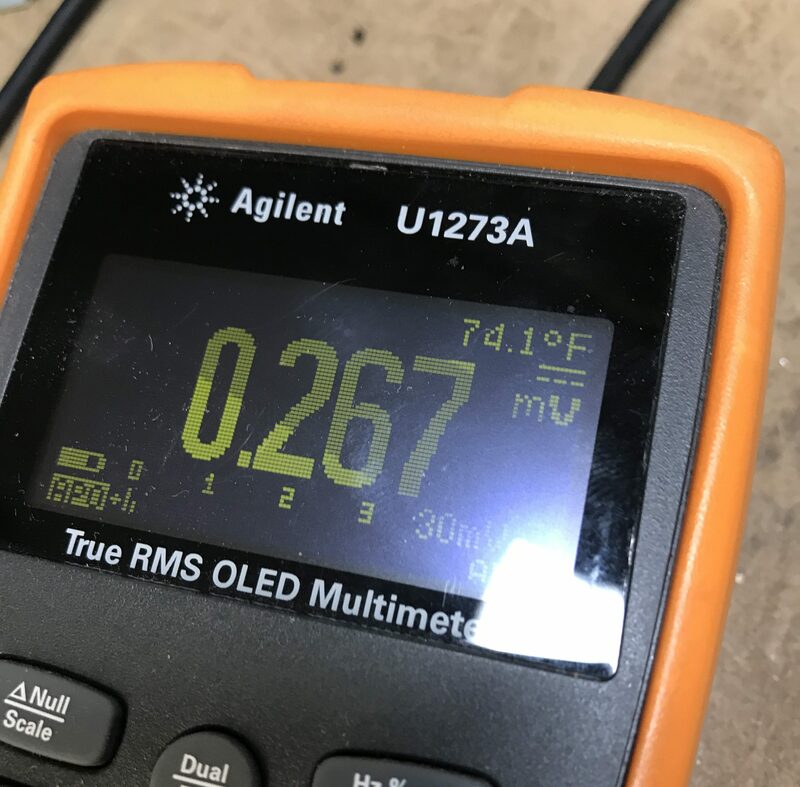 Some people use bright white or blue LEDs, but this can create the wrong effect, a blue so deep its hard to read the dial, or a purple effect that doesn’t look “correct.” In order to look original, we use “soft white” leds. We also change the 33uf capacitor behind the tuning meter. Careful attention must be paid when changing indicator lights to avoid burning the dial string. Re-stringing the tuner is NOT fun. We clamp off the dial string to keep it aligned, and pulled taught. Then we remove the indicator assembly from its place to give us the space to work safely. There is a more detailed slideshow to the right. Before and after pictures are below! Dial removed to replace fuse style lights. 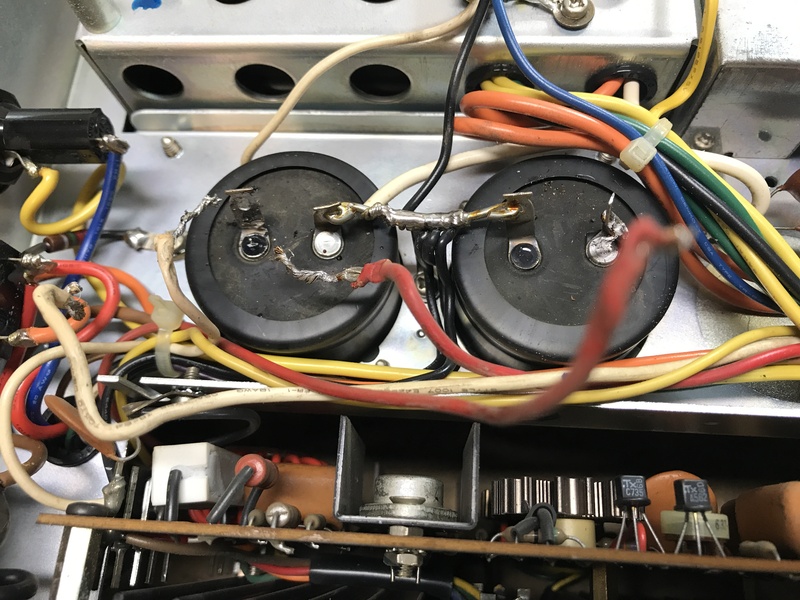 The old fuse lamps get too hot over time and burn out. 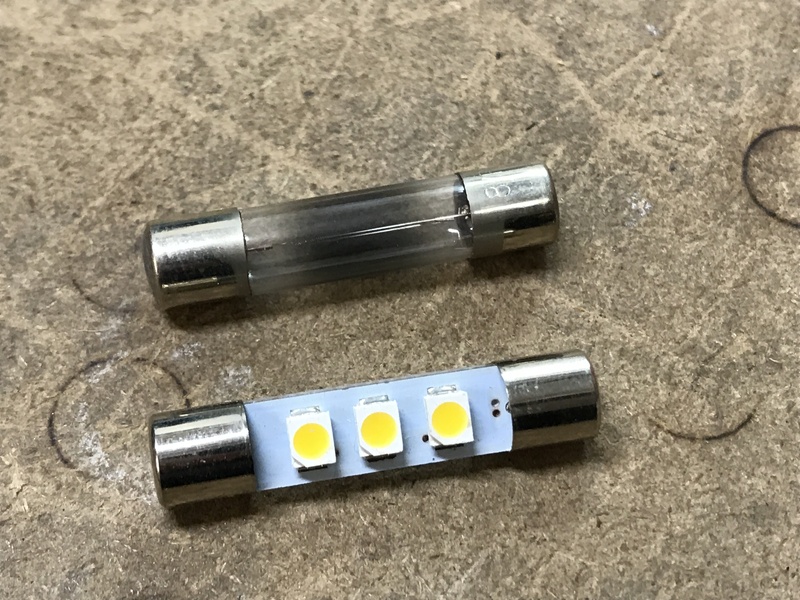 LEDs create no heat and are more reliable. We use “soft white” LEDs to recreate the original blue color. The head from the original lamps burns the original velum paper, turning the dial green over time. We replace the velum paper, which also helps diffuse the light evenly across the dial. The same goes for the meter lamps. These are replaced with LEDs and new velum paper as well. 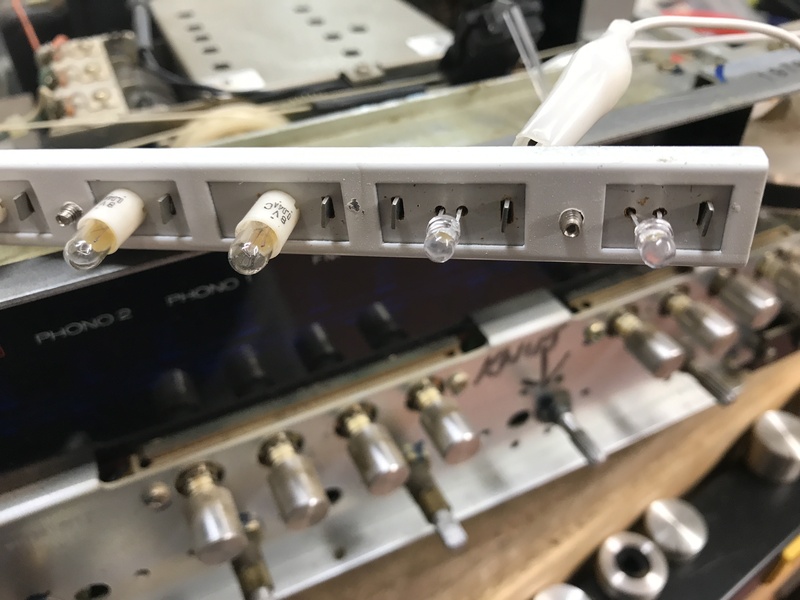 The indicator and stereo lamps are replaced with new, reliable, and cooler running LEDs. The tricky part is replacing the lamp for the dial pointer. We put in a new LED lamp here, as the original ones get dull over time, or burn out completely. We also put a small bit of velum paper here. About three layers give a nice even and not too bright glow. Dial pointer now looks good, with the dial behind it glowing its original blue. Lighting complete! Looks as it did when it was brand new! That’s the meat of it. 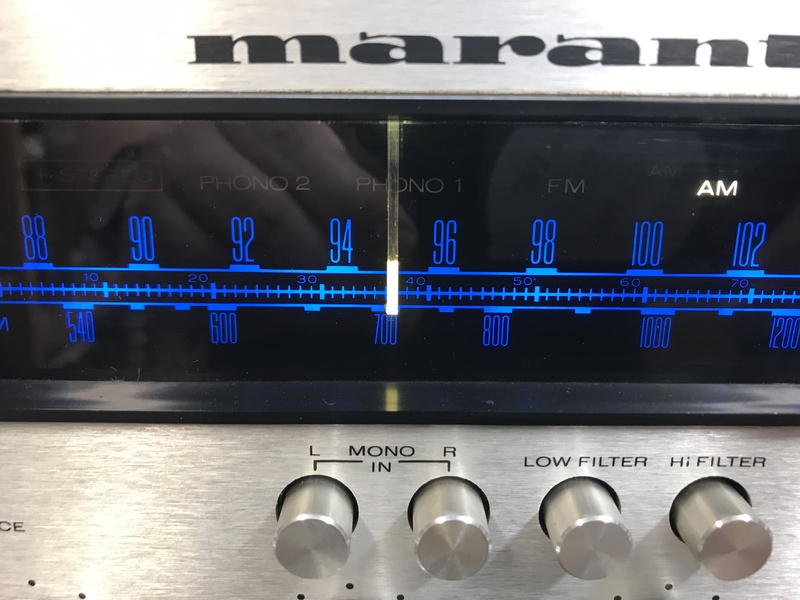 The tuner was tested, and pulled in stereo FM pretty well, what little we get by our store anyway. Avoiding the cost of a tuner recap and alignment, the customer asked us to leave the tuner as is for now. Almost all of our customers avoid FM rebuilds as they are costly due to the time it takes. Also, most customer don’t use FM anyways! The usual things were done to finish the unit. We used De-oxit to clean all the pots and buttons, and Fader-lube afterwards for smooth, quiet controls. We tested the unit after completion, dialed in DC offset and bias/idle current, and cleaned up the faceplate. 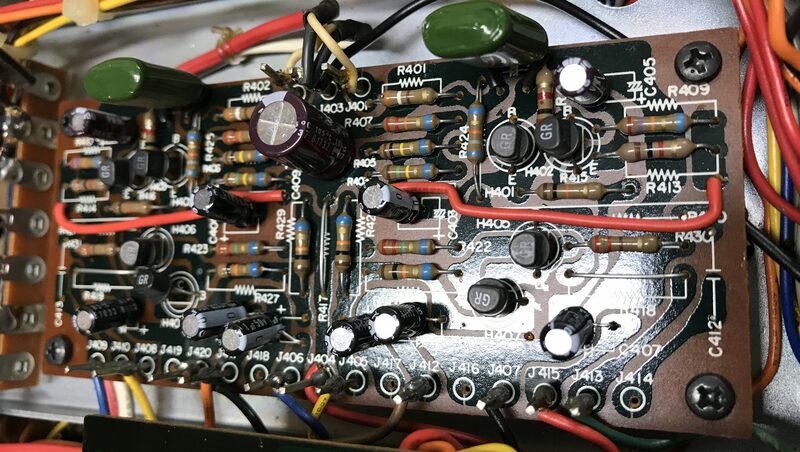 We ultra-sonic cleaned the knobs, and put the 2270 back together. We played it for about 8-10 hours, and then sent it home to its loving owner! 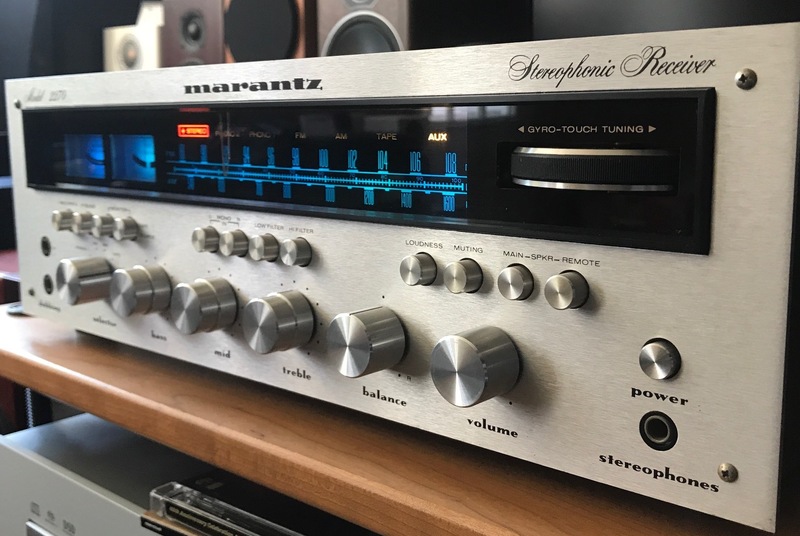 We love doing Marantz 2270s and we know them very well. Enjoy the nice last snapshot of the unit running in our demo room!